Set wake up, vacation or evening lighting schedules to match your lifestyle. Use your lights to wake up to gradual brightness, instead of an alarm. Set the length of time light remains on after motion is detected (1.5/3/6/15 minutes). The energy efficient LED light bulbs are rated for 25,000 hours (20 years). Compatible with Amazon Alexa, Google Assistant, Zigbee and iControl smart home. Light your home, the way you want. Set lighting schedules to match your lifestyle with the app, from anywhere you are. Monitor daily, weekly and monthly energy usage reports and see savings increase. Control up to 50 bulbs, individually or in groups wirelessly through the app. 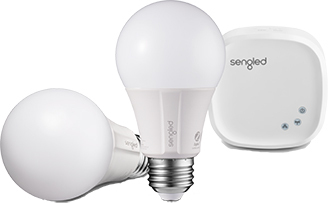 Sengled works with most Apple and Android devices. Sengled uses very little data but pairs well with a TELUS phone plan. Use the app to easily control your lights from your device.